Lake Erie Beach V.F.C "Number 7"
L.E.B. #7 is a 1989 Ford Chassis with a Marion custom walk-thru body. This is our rescue unit. It is the third vehicle due in for all structure fires, vehicle fires, etc. It is the second truck in for all EMS calls and any Mutual Aid fires. It carries a full compliment of EMS supplies with the exception of a gurney. L.E.B. #7 contains a 12K generator which is used to supply electricity to the scene. It provides electricity through 2000' of cord on an automatic reel connected to a four outlet junction box. L.E.B. #7 is also our main lighting truck with two front mounted fully adjustable halogen flood lights and two rear mounted removable tripod halogen flood lights. This unit also carries our extrication tools. Ours is a Halmatro hydraulic tool with cutters and spreader attachments. More often than not, when our company is activated Mutual Aid to any working fire, the requesting company asks for this piece of apparatus first. This is because we have on board six 4500psi compressed air bottles which supplies our cascade system for use in refilling SCBA 2216psi bottles. This system has the capability to refill upwards of 90 SCBA bottles without itself needing refilling. When this system is depleted, the Town of Evans Police Marine unit refills it for us with their compressor located at Sturgeon Point Marina. 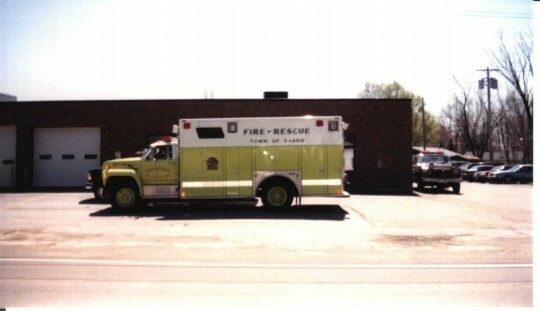 Ours is the only such system located within the Town of Evans and is also utilized by the companies in the neighboring Town of Brant. This vehicle also carries four Scott brand SCBA packs in the rear interior passenger compartment. Including the driver and "radio operator" this unit can carry eight additional firefighters to the scene. 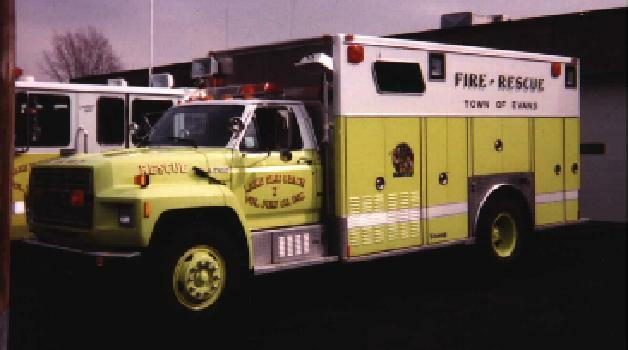 It is also equipped as an Incident Command Unit with an Erie County Fire radio, a MERS(Medical Emergency Radio Service) radio, and a cellular phone in the rear passenger compartment. Another responsibility of this apparatus is to carry backup supplies for our Fire Police units with equipment such as flares, cones, traffic signs, traffic wands, and reflective vests.